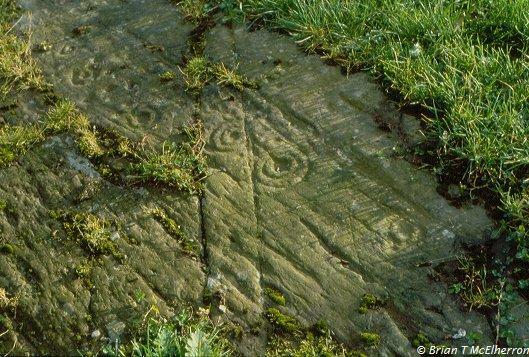 At Ballystokes (J526457) a number of cup-and-ring marks cover a large slab about 4m long. There are at least seven cup-and-ring marks and many more cup-marks. Audleystown Court Tomb (J562504) was visited. A cairn about 24m long by 11m wide contains two court-tombs, both with shallow courts and four-chambered galleries. The galleries are well defined and there are some corbel stones in place. The stones in the galleries are less than 1m high, those in the south-east tomb being the highest. Lough Money Dolmen (J539464) was viewed from the roadside. A capstone rests on two slab-like uprights, forming a simple rectangular chamber. Nearby is Carrownacaw Standing Stone (J543464). It is about 3m high and partly supported by a wire tied to a tree. Excavation of the area revealed a ring-ditch nearby which may be associated with the stone. Ballynoe Stone Circle (J481404) was visited. It is about 30m diameter and composed of many stones some of which are up to 2m high. Within the circle id a large oval mound surrounded by a smaller circle. Excavation of the mound revealed two cists. Outside the main circle are at least four outliers which form an approximate line running through the circle. There are a number of other stones in the field which may be associated with the monument. From Ballynoe may be seen several other ancient sites, including the remains of Castle Skreen. The Mound of Down (J482450) appears to be a crescent-shaped motte with a massive bailey. It is now believed that this is an Iron Age site, possibly contemporary with Navan Fort. Quoile Castle (J496470) was visited. It is a three-storey building with the ground floor intact and the upper floors fragmentary. It has been partly restored. The doorway is guarded by a murder-hole which leads from above first floor level. There is a guard chamber to the left of the entrance. The inner doorway has some pecked decoration. A straight mural stairway rises to the right of the doorway. It changes to a spiral above the second floor. There are two large rooms at the ground and first floor levels. The lower rooms are vaulted. Some sites marked on the OS maps were investigated. The Mourne Country Outdoor Pursuits Map indicates a rath upstream from Leitrim Bridge (J217282). A small mound near the corner of the field may be the only trace of this rath. A cashel on Leitrim Hill (J225278) was inspected. About half of it remains. The walls are about 1m high and appear to have been rebuilt. Closer inspection shows that they are about 3m thick at the base. The diameter of the cashel is about 45m. Grugganskeagh (J190261) is a small rocky hill with a stone-lined depression near one edge. It is about 15m diameter at the top. Another visit was made to two souterrains noted previously. The first is near Cave Hill Road (J155398). On the first visit a small opening near the bottom of an excavation pit indicated a souterrain. On this occasion this opening was not visible but further uphill the souterrain was found to have been bisected by a ditch. Lintel stones of both sections are visible but a great deal of excavation would be necessary before entry could be made. The second souterrain is near Clarkhill Wood (J340382). Two sections of a souterrain lie within a small cashel. The entrance to one section is clearly visible and little excavation would be needed to enlarge it. It is possible to see that this section extends for about 5m and is about 1.5m high. However because of the fading light and the late hour entry was not attempted. No attempt was made to investigate the other section.